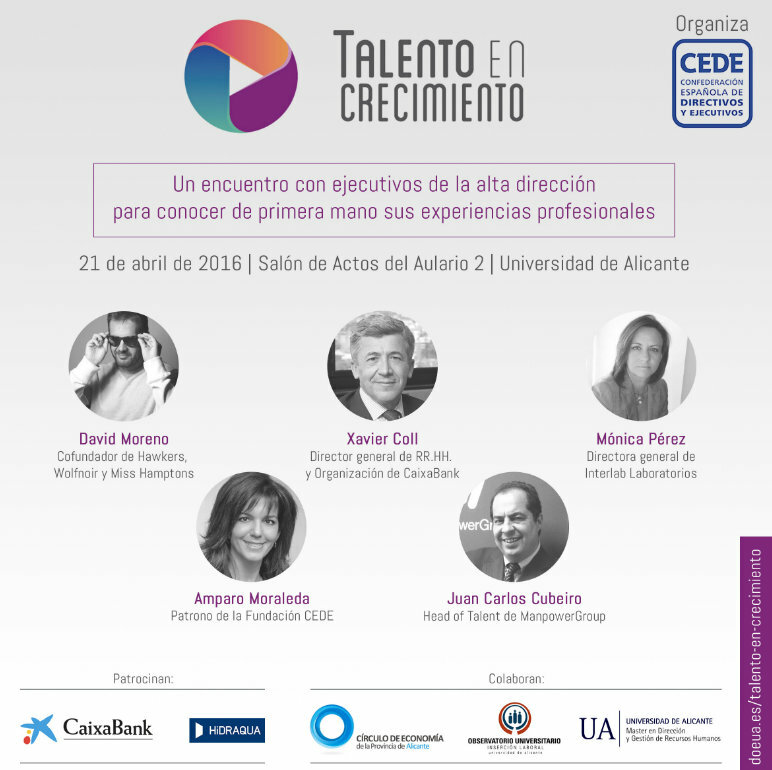 It YIELDS it - Spanish Confederation of Directors and Executives, in collaboration with the Circle of Economy of Alicante, the Observatory of Labour Insertion and the Máster in Direction and Gestión of Human Resources of the University of Alicante, presents a new edition of "Talent in growth"in the Living room of Acts of the Aulario II the University of Alicante the day 21 April 2016. The sessions of this Meeting will allow to the young students or recently graduated that initiate his professional career go in in contact with executives of the high direction and know at first hand his professional experiences. Dª Nuria Grané, Vice-chancellor of Students of the University of Alicante. D. Manuel Gago, Vice-president of YIELDS. D. Javier Fur, President of the Circle of Economy of Alicante. D. David Moreno, Cofundador of Saldum, company that directs the marks Hawkers, Wolfnoir and Miss Hamptons. Saldum Sells his glasses in more than 50 countries and in two years of life has reached a turnover of 40 million euros, what turns it into the mark of glasses of sun more sold on-line in Spain. David is biologist of academic training and in the company has the functions of Creative Director and Institutional Relations. 10.30h.- 12.00h. Learn of the experience. The path of two managerial heights will do of this session a space to exchange and learn, deepening in the characteristics that define the career of a good director and tracing the lines to be followed to be able to attain your put. D. Xavier Coll, general Director of RR.HH. And Organisation of CaixaBank. Graduate in Medicine by the UB, MBA by the University of Chicago and MPH by Johns Hopkins University. At present General Director Attach of CaixaBank, Human Resources and Organisation. Previously Vice-president of Human Resources of the World Bank and of the European Bank of Investment (BEI). It is president of the Executive Committee of the ICLD " International Center for Leadership Development" of the Foundation YIELDS. Dª Amparo Moraleda, Master of the Foundation YIELDS. Amparo Moraleda is Industrial Engineer by the University Pontificia of Comillas and PDG by the IESE. It went in in IBM with 23 years like technician of systems occupying diverse charges until, in 2001, was appointed president of IBM for Spain and Portugal. In 2008, it abandoned IBM to assume the international direction of Iberdrola, responsibility that developed until 2012. At present it is adviser of Faurecia, Solvay, CaixaBank and Airbus Group. It belongs to distinct councils advise and patronatos. It is master of the Foundation YIELDS. 12.30h.-13.15h. From the first years until the director. The world transforms continuously: new technologies, new models of business and new paradigms. In this sense, the professionals have to know react to these continuous changes. The new profiles require new competitions and new dynamics of work. The styles of leadership also have to evolve, go out of the zone of confort and go to a new form to do: the leadership in network. Dª Mónica Pérez, general Director of Interlab Laboratories. Mónica Pérez is graduate in Chemical Sciences by the University of Alicante and máster in Commercial Direction and Marketing. It has been director of Chemical Market-Pharmaceutical of Aqualogy (Agbar) and RSC and Market Development Manager of Laqua S.A. In the actuality is general director of Interlab Laboratories, laboratory of analysis of water. 13.15h.- 14.15h. Attitudes for the empleabilidad. In a labour market like the current, are many the questions that concern to the youngsters, one of the communities with greater index of unemployment. To give with these answers is necessary that know what look for the companies. Resolve these questions and contribute a practical vision of the current labour panorama is key to discover real opportunities. In the era of the people and the talent, improve the empleabilidad involves a change of attitude. ¿With which attitude undertake our challenges and aims? D. Juan Carlos Cubeiro, Head of Talent of ManpowerGroup and mentor of the area of Coaching of Human Age Institute. Juan Carlos Cubeiro exerts like Head of Talent in ManpowerGroup, activity that paginates with the teaching like professor of Leadership and Dinamización of Teams in the University of Deusto and of Strategy and Gestión by Competitions in Saint Pablo-CEU and in ESADE. Also it is CEO of Right Management (company that forms part of the Fortune500, with 33.000 professionals and 400.000 customers in 82 countries) and President of Honour of the Spanish Association of Coaching and Consulting of Processes. D. Juan Luis Nicolau, Dean of the Faculty of Economic of the University of Alicante.